A wildfire burns behind a winery, Oct. 14, 2017, in Santa Rosa, California. 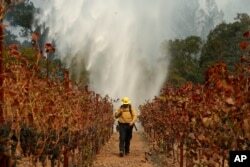 Firefighter Chris Oliver walks between grape vines as a helicopter drops water over a wildfire burning near a winery Saturday, Oct. 14, 2017, in Santa Rosa, California. Carpenter said he had a chance to try some smoke-tainted wines in 2008, and they were not very pleasant - like a bacon-flavored wine. “If we sense any of that, we won't bottle,” he said. People fill a patio tasting wine and listening to music at the historic Gundlach Bundschu winery in Sonoma, California, Oct.28, 2017. “It was a place to come and give each other hugs,” said Bundschu, whose own family has been dealing with the loss of her parents' home. Wineries are filling the pages of the San Francisco Chronicle with ads. 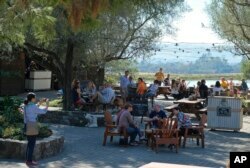 “We are open and welcome you back to Napa!” read one. Some are donating their tasting room fees to wildfire relief charities.